A proposed new Constitution for Sri Lanka appears to have united warring factions in the Sri Lanka Freedom Party (SLFP) and the SLFP-led United People’s Freedom Alliance (UPFA). They want to adopt a common approach. In what appears to be a landmark event, lawmakers who are supporters of President Maithripala Sirisena and those of his predecessor Mahinda Rajapaksa met for talks last T uesday morning. The venue was the Parliament library. Representing Sirisena were ministers Nimal Siripala de Silva, Anura Priyadarshana Yapa, Susil Premajayantha and Faiszer Musthapha. Representing the Rajapaksa side were Mahajana Eksath Peramuna (MEP) Leader Dinesh Gunawardena, who heads the ‘joint opposition’, SLFP MPs Kumara Welgama (Kalutara District), Dullas Allahaperuma (Matara District), Keheliya Rambukwela (Kandy District) and Prasanna Ranatunga (Gampaha District). There was little doubt, as the deliberations continued, that the meeting had the blessings of the SLFP leader, President Maithripala Sirisena. His protagonists claim that winning over dissenting factions would unite party ranks and thus deny Rajapaksa a strong platform over issues relating to a new Constitution. Since being elected in January last year, Sirisena is still battling to gain overall control of his party. He marked his first anniversary in office with little success and there are fears he has lost ground among the grassroots level of the SLFP. This has seen a growing conciliatory approach by him towards his one-time adversaries within the party. On the other hand, Rajapaksa, too, had given his blessings to those who support him to conduct the talks for a common approach. The very fact that his loyalists are engaging an important segment of the Government under President Sirisena in itself is sufficient recognition for him and his backers. It is a public acknowledgement that they have a role to play. It also checkmates to a considerable degree the role of the UNP segment of the Government by denying it a free run over constitution making. Yet, unlike Sirisena’s increasing move towards reconciliation, Rajapaksa’s response is a measured one. Smarting under different probes against him and members of his family, he is also embarking on other plans. If they bear fruition, the first adverse impact would be on Sirisena and the SLFP he leads. This, as revealed earlier, is through the formation of a new political party by Rajapaksa and a broad alliance with other like-minded ones. That could be a formidable challenge at the upcoming local council elections. Those on both sides of the divide concede it would make things very difficult for the SLFP at the local polls if a third force emerges, and the outside possibility that the Sirisena faction could even emerge in third place to the UNP and the Rajapaksa faction. The thrust at Tuesday’s talks was on the amendments to the resolution moved by Prime Minister Ranil Wickremesinghe in Parliament on January 9. This was for the entire House to serve as a Constitutional Assembly to formulate a Constitution. On that occasion, where he made a nationally televised speech, Wickremesinghe did agree to consider amendments suggested by political parties represented in Parliament. In addition, the Government also made available to them the different amendments raised by the ‘joint opposition’ which they were willing to consider, as revealed exclusively in these columns last week. In the days after moving the resolution, there appears to be a hardening of the Government position. Premier Wickremesinghe had been prompted to say that there would be no changes to the resolution that he moved — a threat which could see a boycott by the ‘joint opposition’ and a possible abstention at voting time by SLFP lawmakers. That would naturally threaten the two-thirds majority required for the passage of the resolution. At the centre of the controversy are some remarks made by Professor G.L. Peiris. These comments found their way to the local media. Wickremesinghe was livid at his repeated remarks, both in the media and at various meetings in the past days, that the new Constitution proposed by the Government would do away with the unitary status of the country and deny Buddhism its pride of place. The remarks, UNP stalwarts believe, are to provoke SLFP lawmakers into not extending support and thus enhance former President Rajapaksa’s nationalistic power base. Peiris was the main constitutional affairs advisor to former President Chandrika Bandaranaike Kumaratunga. A draft Constitution he formulated in 1997 had to be changed drastically in 2000-2001. There, he had in fact omitted the words “unitary” and substituted it with the words to make Sri Lanka a “union of regions.” Thereafter, having crossed over to the UNP and as a Minister in the Ranil Wickremesinghe Government in 2001, he became a chief negotiator during the peace talks with the LTTE and was an ardent backer of the Norwegian-brokered ceasefire, championing the cause of devolution of power to the North. Amidst this growing crisis, Speaker Karu Jayasuriya, has summoned a meeting of leaders of political parties in Parliament on Tuesday (January 19) to discuss issues. This is a prelude to a debate and examine the possibility whether a vote on the resolution could be taken on January 26. Wickremesinghe, who this week met a group of senior politicians backing Rajapaksa, declared: “You are all going behind a great pundit. He was advising another leader earlier by making statements of his own. He is no more a member of the House.” That he was angrier was evident when he spoke at the National Thai Pongal Festival event at the Weerasingham Hall in Jaffna on Friday. He said, “G.L. Peiris and his backers are trying to give a wrong picture about the proposed Constitution. I am not trying to formulate Constitutions with Peiris and his junta but with our own Parliament. He warned that they should not disturb the peaceful climate in the country. Even President Sirisena has warned us to be wary of juntas. They have realised the need for transparency only after they lost the elections,” he said and added that the Constitution would be formulated by the 225 members in Parliament. Even Chandrika Bandaranaike Kumaratunga, who said she loathed the late J.R. Jayewardene over the 13th Amendment to the Constitution has joined us. Ms Kumaratunga was present in Jaffna on Friday. A notable absentee at the event was President Maithripala Sirisena. Invitations sent out for the event listed his name but a spokesperson at his office said he was unwell. However, unbeknownst to many, the UNP leader does not seem to have shut the door altogether on views from other political parties. One source familiar with the goings on said Wickremesinghe would stick to the Government’s original promise to examine different amendments. This would only be after next week since he is expected to travel to Switzerland for the World Economic Summit in Davos. He is due back in Sri Lanka on January 24. Thereafter, he will hold talks with leaders of different political parties in Parliament. The move may necessitate a postponement of the date of a vote on the resolution. Yet, some of those gathered for the meeting last Tuesday at the Parliament Library were sceptical. They said if the amendments were not accepted, the Rajapaksa faction should not vote for the resolution and urged other colleagues also to act likewise. However, most believed it would be accepted and declared they should support the move. This appears to have been influenced by Opposition parties receiving an advanced copy of a text which contained the amendments the Government has accepted. Revealed exclusively in these columns last week, the text was the result of representations made by the ‘joint opposition’ and other political parties. “‘The new constitution should be drafted in keeping with the existing constitution. There are Standing Orders of Parliament that could be followed or public opinion could be sought after the appointment of a Parliamentary Select Committee. The Government has decided to follow the process under the Standing Orders where the entire Parliament would be converted into a Committee (Constitutional Assembly). This is not similar to what was done in 1972. “The Prime Minister moved the resolution after it was placed on the Order Paper. The President summoned us for a discussion and thereafter we conveyed our position to the Prime Minister. We also discussed the matter with other parties. We put forward nine proposals. They were accepted by the Prime Minister and members of the government. MEP leader Dinesh Gunawardena and his group, too, submitted some proposals. The proposals are very similar to the proposals we submitted. Our proposals will also be included in the Order paper. The other party proposals too will be included. “Thereafter, the debate will take place and on selected days they will meet as a Parliamentary Select Committee (Constitutional Assembly) in Parliament. The required Sub committees will be appointed thereafter and public opinion will be sought. One of the suggestions made in the resolution is that it should not be introduced as a ‘New Constitution.’ The word ‘New’ should be dropped. There is agreement on that. We also proposed that a preamble should be put forward. On that too there has been agreement. Regarding the proposal that the Standing Orders should be suspended we suggested that a decision should be taken after discussion. On Wednesday night, just a day after their meeting in the Parliament Library, pro-Rajapaksa lawmakers met at the residence of G.L. Peiris in Colombo’s Narahenpita area. Though seemingly joking, Rajapaksa was to take a dig at Vasudeva Nanayakkara for his remarks at a public meeting that their political campaign was now devoid of the Rajapaksas. “You all are going to drag Rajapaksas into more trouble,” he said jocularly but the message was clear. There was also a discussion on the upcoming local council polls. Rajapaksa was to urge party leaders to keep the pressure on the Government so that there would be no moves for a postponement. Yet, it could not be held until the proposed entire Select Committee of the House (or the Constitutional Assembly) decides on a new electoral system. President Sirisena has declared that the local polls would be held under the new system. Though he is with SLFP colleagues on the need for common ground, Rajapaksa has also been otherwise busy preparing for the upcoming local council elections. For him, it is a challenge to deny Sirisena overall control of the SLFP. Rajapaksa invited those who headed local authorities and provincial councils or held key positions for a meeting at his residence in Mirihana. In view of the floor area being small, each body was to be represented by not more than two. However, some former local authorities were represented by as many as seven to eight. Yet, those from the districts of Jaffna, Kilinochchi, Mullaitivu and Batticaloa were absent. Rajapaksa began his speech by pointing out that most of those present had helped him during the presidential elections in 2005 and 2010. “Now tell me how I can help you,” he asked. He said he had been receiving complaints from the public since officials began running the local bodies. He noted that Parliaments and Provincial Councils were foreign concepts whilst Pradeshiya Sabhas, which form most of the local authorities, are a system that had been in existence even during the reign of ancient kings. A few of the speakers were to say they had no plans to contest on the SLFP ticket and claimed that the party had lost grassroots level support. Basil Rajapaksa, the onetime chief organiser of the SLFP during his brother’s reign intervened to ask what they thought about moves under way to form a new network. He used the phrase “network” for what he really meant was a new alliance which is now being strongly discussed. Such an alliance is to be led at the apex by a new political party. Thus, a new political party is to emerge first before finality is reached on the new alliance. Some of those who took part were later making speeches to say that a new party would emerge soon to be led by a leader in a saataka or shawl. They did not make clear whether it was Mahinda or Basil, both of whom wore the maroon shawl with their national dress. The Janatha Vimukthi Peramuna (JVP) has also handed in a one-page amendment to Premier Wickremesinghe’s resolution, its leader Anura Kumara Dissanayake told the Sunday Times. He said this resolution says that the Constitutional Assembly was to seek the views and advice of the People, on a new Constitution for Sri Lanka. He said, “Preparing a draft of a Constitution Bill for the consideration of Parliament in the exercise of its powers under Article 75 of the Consideration” was not acceptable to the JVP. “(1) A Committee of the whole Parliament is appointed by resolution that Parliament resolve itself into Committee. “This is not the only issue we are facing with the Government. We are now talking to civil society organisations and will soon launch a campaign to tell the public that this Government has not kept the pledges made during the presidential and parliamentary elections. 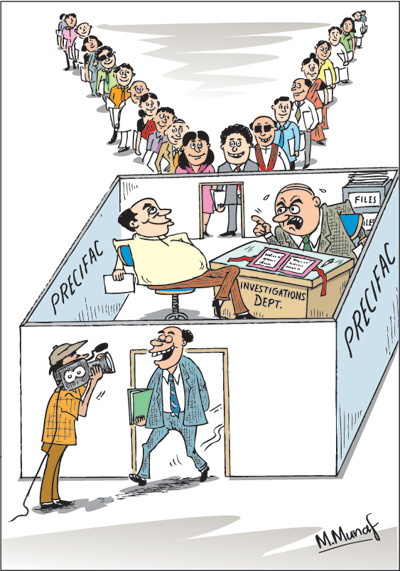 Corruption remains rampant and there is nepotism. No one has been brought to book over mega scale corrupt activity,” Dissanayake added. He also lamented that the law and order situation was deteriorating and no corrective measures were being taken. Constitutional changes, apart from a new electoral system, would also incorporate the outcome of the Government’s reconciliation efforts. Measures to set the stage for this process continue with the Government taking several steps to address the northern post-separatist insurgency issues. On Friday, Prime Minister Wickremesinghe told a conference of military top brass at the Security Force Headquarters in Palaly, Jaffna that it was necessary to formulate a long-term plan for the release of private land held by the security forces. “Let us work out what we are going to do for the next few years,” he said and added that the task should be carried out by the Governor with the help of the military. He said that the international community would help restructure the armed forces once this process was complete. At the National Thai Pongal festival at Weerasingham Hall which the Premier attended after the conference, there were concerns among military officers. The Chief Minister C.V. Wigneswaran, a former Supreme Court Judge, had in his speech declared that there was a “150,000 strong Army of occupation” in the North. For good measure he spoke in English. It was clear he was delivering a message to British Foreign and Commonwealth Office State Minister Hugo Swire who was a guest at the celebrations. The conference at SFHQ (Jaffna) was also to see other matters being raised. Vijayakala Maheswaran (UNP MP – Jaffna District) said that the security forces should release the Myliddy fishing harbour. The appeal was rejected by Premier Wickremesinghe. He said the harbour was in close proximity to the runway of the Palaly air base. There were plans to expand the area into a regional airport and the harbour area would become necessary. Navy Commander Vice Admiral Ravi Wijegunaratne was to point out that fishing is not allowed in the lagoon near the Bandaranaike International Airport (BIA) in Katunayake. This is to ensure the safety of aircraft taking off or landing. Ms Maheswaran then appealed to the Premier that compensation should be paid to the owners of the land near the harbour. He agreed that her request would be considered. The Police Chief, Commanders of the Army, Navy, Air Force, NP Governor H.M. G.S. Palihakkara, Law and Order Minister Sagala Ratnayake, State Minister for Defence Ruwan Wijewardene were among those who attended the conference. Three senior officers in the North – Major General Chagi Gallage, GOC 51 Division, Major General Priyantha Jayasundera GOC 52 Division and Brigadier Nirmal Karunaratne GOC 55 Division were also in attendance. The release of a number of other areas where schools and hospitals had been located were discussed. In one instance, land where a hospital was located in Tellipalai is to be released but access will not be allowed through the High Security Zone. A separate road is to be constructed. The possibility of releasing six temples which remain within the SFHQ area was discussed. Premier Wickremesinghe urged senior officers to look into how it could be done with independent access to these places. Outgoing Commander, Security Forces, Jaffna, Major General Nandana Udawatte gave a briefing on the release of lands. He said since 2009 (after Tiger guerrillas were militarily defeated), an extent of 19,165 acres had been released to their original owners. He said in areas surrounding the SFHQ an extent of 6,976 acres had been released since 2009 until the end of last year. Commander, Security Forces Jaffna: Major General Mahesh Senanayake. He was the Military Secretary (MS) at Army Headquarters. He is succeeded by Major General N.J. Walgama as MS. The present SFHQ (Jaffna Commander) Major General Nandana Udawatte has been appointed Adjutant General at Army Headquarters. Commander, Security Forces, Wanni: Major General P.U.S. Vithanage. He was earlier Security Force Commander, Mullaitivu. Major General Boniface Perera who held the position of Commander, Wanni, has been appointed Director General – General Staff at Army Headquarters. Commander, Security Forces, East: Major General K.M.U. Wijeratne. He was earlier General Officer Commanding (GOC) of 54 Division. Director General, Infantry: Major General A.P.de Z. Wickremeratne. He was earlier GOC 66 Division. Major General Lalith Daulagala who was DG Infantry has been attached to Army Headquarters. GOC – 53 Division: Major General L.H.S.C. Silva. He was earlier attached to Army Headquarters. GOC – 54 Division – Officiating – Brigadier W.B.D.P. Fernando. He was earlier Director, Psychological Operations at Army Headquarters. It is not good news for the Government that a new Constitution and related measures are coming in the backdrop of an unexpected reality — the soaring cost of living. It was fuelled further by a string of budget proposals, some withdrawn on the instructions of President Sirisena. Yet, the resultant price increases, like for example the common man’s packet of rice, have not been checked though some taxes have been put on hold. Naturally, this has dealt a crippling blow on the popularity of the Government. Added to that, the law and order situation has continued to deteriorate despite promises during polls campaigns to arrest it. Foreign dignitaries and officials are arriving almost weekly to pressure Government leaders to implement the US-backed resolution at the UN Human Rights Council – a resolution Sri Lanka has co-sponsored. Sri Lanka will have to tell the UNHRC in June what it has done. One cannot be unmindful of these and other factors when Sri Lankans are asked to vote for a new Constitution at a national referendum. A litmus test would no doubt be the local council polls. The Government needs to be constantly sensitive to the daily woes of the people and the many grim realities they portend.